"With Barts… tone desired, tone achieved! Bartolini gives me the flexibility and sound precision required for any stage. From all Neck pickup to all Bridge pickup, and everything in between, distinguished character is always revealed." Quetzal Emanuel Andrade is a bilingual Music Educator & performing musician from Fresno, California. Quetzal is fluent in English & Spanish. He is well versed in multiple rhythm section instruments, such as guitar, piano, & drums. 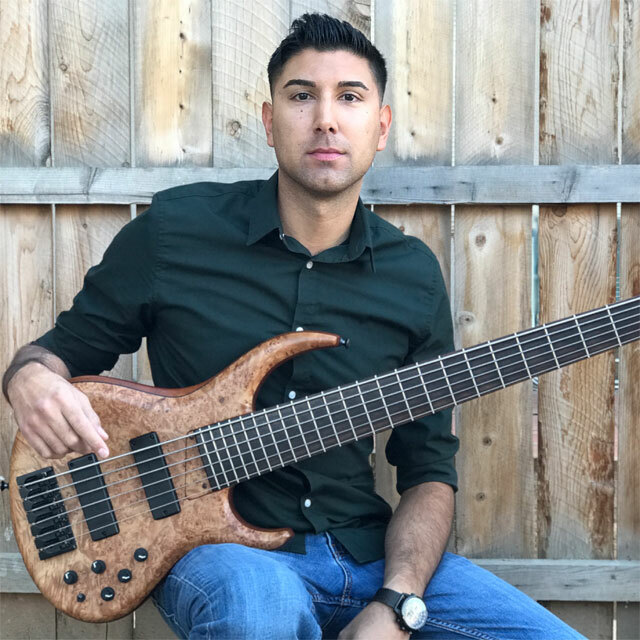 Although, he received his bachelor’s degree in Music with an emphasis in Percussion from CSU, Fresno, he developed a natural love for bass & has preferred it above all instruments. He has experience harmonizing background vocals while playing bass in multiple groups. Quetzal submerges himself into performing any genre confidently with his Bartolini loaded MTD 635-24 bass slung over his shoulder, all while smoothly multitasking on his keyboard set up to add harmonic accompaniments. He relies on his bass to produce clear-cutting tone that only Bartolini pickups can provide. Quetzal composes a variety of compositions for his school ensembles (Band, Guitar, Percussion) & also, writes for his personal performing groups. He uses FINALE Music Notation software when charting music & has experience with Logic Pro recording software. Quetzal has taught middle school music for 9 years & has played bass for 16 years. He gives God the glory & plays at 2 churches every Sunday.